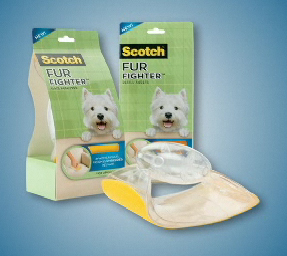 I saw these Scotch Fur Fighters on TV during lunch at work, and Joel told me his sister had one and it worked great. I am so tired to rolling away with one of those sticky tape rollers. We have a leather couch, but Aaron's car seats are cloth so they are coated in Oscar and Stewie hair. Also my chair at work has accumilated a lot of pet hair to so I have high hopes for the Fur Fighter! Oh please won't you let me know how these work out for you! Whisky has a chair, but when guests come over he has to give it up and unfortunately also gives up about 20lbs of dog hair when he leaves it. It needs serious help! My husband's favorite thing right now is the Fur Fighter! It easily picks up all of our pug's fur and our furniture looks brand new again thanks to the Fur Fighter. I'm wondering about short fur. The commercial shows it doing a great job with medium & long fur but do the fingers grab the short stuff? One of my cats has extremely short fur that doesn't clump. It's like picking up tiny needles. It worked great on some surfaces, but not that great on my office chair. I don't know what my chair is made of but the hair is so embedded! I may need a fresh sheet or using it in conjunction with a tape roller may help. Hey LJC, Been a long time reader of your site. I just had to comment here.. I recently got the Pledge Fabric Sweeper to get the massive amounts of gold hair from my yellow lab Amber off our BLACK bed spread.. and it works FANTASTIC!! I even got a coupon for a free one by emailing Pledge and telling them how much I liked their product! Never heard of this one, but thought I would share my experience with the Pledge one. Good luck in your fur battles! !